Coach Dustin Delaney led SM East to its first-ever state football title during his five years with the school. Former Lancers football coach Dustin Delaney, who resigned from his position with SM East last year over concerns with the school district’s athletic administration, on Wednesday posted a message on Twitter saying he was resigning from his new job leading Eaglecrest High School’s football team in Aurora, Colo., one game into his tenure there. In his explanation, Delaney said he had been frustrated by the lack of functioning facilities and cleanliness in Eaglecrest’s locker rooms, and that field maintenance issues had left “potholes” on the field that had posed safety hazards to players, leading two to sustain knee injuries. Delaney, who finished his five-year tenure at SM East with a record of 52-8, piloted Eaglecrest to a 49-35 victory in its season opening game August 24. The Cherry Creek School District announced the team’s offensive coordinator will take over as interim head coach for the rest of the season. 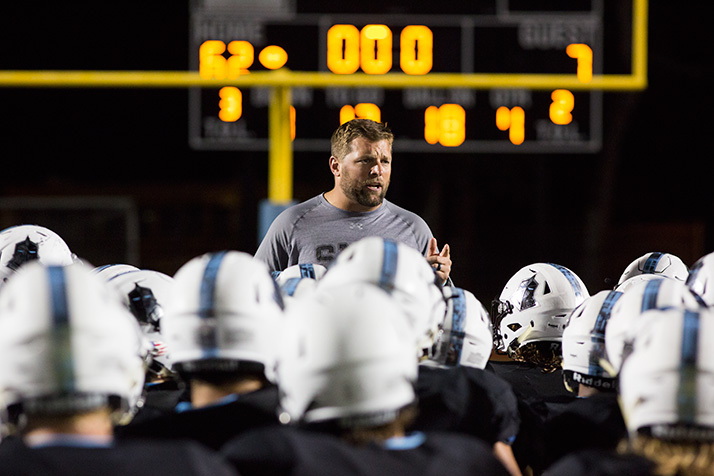 The scenario in Aurora largely mirrors the scene back here in Prairie Village, where first-year head coach Fred Bouchard, who had been hired to replace Delaney, announced his resignation just days before the season was set to begin. Though Bouchard cited another job opportunity as the primary factor behind his decision to leave, he hinted at tensions with Shawnee Mission’s central administration. The district tapped the Lancers’ offensive coordinator Justin Hoover to take over as head coach. Delaney informed district administrators of his intent to leave the SM East job after the season was over on August 31, 2017. He told players he was resigning in November after their final game of the year. Both he and his wife Heidi, who taught science at SM East, remained employed with the school district through the end of last school year.